It is certainly true that the Navajo policeman Lieutenant Joe Leaphorn didn't really like his Zuni neighbors, and not just because he'd had a Zuni roommate during his freshman year at Arizona State. But when the young Zuni Fire God Ernesto Cata disappeared, Leaphorn was called upon to help find the boy (in part because, against tradition, Cata's best friend was a Navajo boy, George Bowlegs). The Fire God, who plays an important part in the Zuni religious rituals, not only had disappeared - it turned out he'd been murdered. And the Navajo boy was missing, Some people thought George Bowlegs had killed his friend. Leaphorn knew he had to stay neutral somehow because he'd have to find out what really happened. His investigations crossed the paths of some local hippies and some local anthropologists-and the other world, the world of strange religious beliefs, kept coloring the scene. 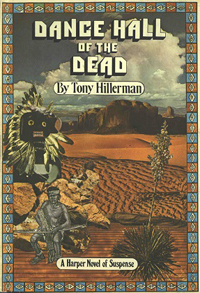 Set against a completely authentic background, filled with mysteries and terrors, this is a story to chill the mind and touch the heart as well (Hillerman, 1973: Promotional copy from the book jacket).